Tareekh Ibn Khaldun is an authentic book on Islamic history which was written by Allamah Abdur Raḥman Bin Muhammad Bin Khaldun. Translated in to Urdu by Hakeem Ahmd Hussain Elahabadi. Complete 13 Volumes of the world trusted history along with its Muqaddimah, the amazing magazine that laid foundation of Sociology. Allamah Ibn khaldun has the singular distinction of being the first Sociologist of the world and the acknowledged founder of the Philosophy of History. 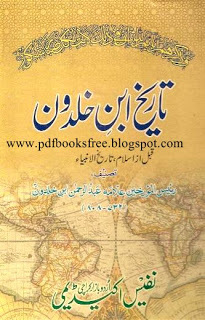 You can download Tareekh Ibn Khaldun Urdu version all volumes from the below mentioned links in Pdf format to read offline.